Several canid fossils, which were originally discovered in the early 20th century, are known from Early and earliest Middle Pleistocene of Java (Indonesia). There's bit of confusion as to which genus these canids belong. 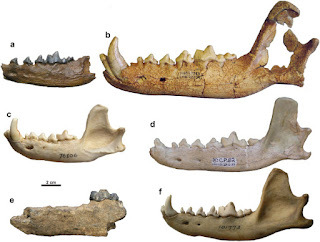 Most scientsts now say they belong to Xenocyon ('strange wolf'), an extinct subgenus of Canis, while others place them within Megacyon, that seems to have been diverged from Xenocyon. On the Indonesian island of Java, fossils of two variants of Xenocyon have been unearthed near Trinil, a palaeo-anthropological site on the banks of the Bengawan Solo River on eastern Java. The larger-sized fossils belonged to Merriam's Wolf (Xenocyon merriani), a canid that lived in the early Pleistocene (ca. 1.2-1.0 million years ago). It was gradually replaced by the small-sized Javan Dwarf Wolf (Xeoncyon trinilensis) during the earliest Middle Pleistocene (1.0-0.8 mya). The latter is probably an anagenetic dwarf derived from the larger form of the preceding period. The change in body size of Xenocyon on Java over time is likely the effect of increased competition within the carnivore guild within the restricted boundaries of the island. More competition meant less food. Less food meant more hunger and – eventually – a pronounced body size shift. That smaller size allowed the Javan Dwarf Wolf to shift to (and survive on) much smaller prey, like mice. The degree of endemism of terrestrial mammals of the earliest Middle Pleistocene horizon of the site Trinil, which has also yielded Homo erectus erectus fossils, indicates that during this period, Java was marginally isolated which allowed for a corridor dispersal to the island with subsequent vicariance. The following continentalisation enabled the invasion by mainland terrestrial mammals, as is seen in younger layers at Trinil, and eventually by Homo sapiens and Cuon in the Late Pleistocene to early Holocene.